Porsgrunn Maritime Museum and Exploratorium is situated in the Norwegian town of Porsgrunn, 100 km south west of Oslo. The new museum will tell the story of the town’s dock yard industry and its maritime history, which has employed thousands of people from the whole region. 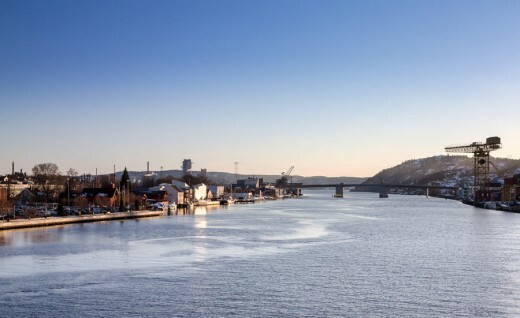 In addition, the attractive location of the museum right on the riverside opens up an important process for the city concerning the future extensive urban renewal of the entire Porsgrunn Harbor area. 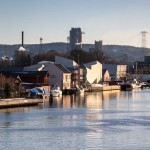 ”Porsgrunn is an industrial town, which is reflected clearly in the museum’s surrounding context. It consists of small to medium sized industries in the shape of small characteristic wooden buildings. 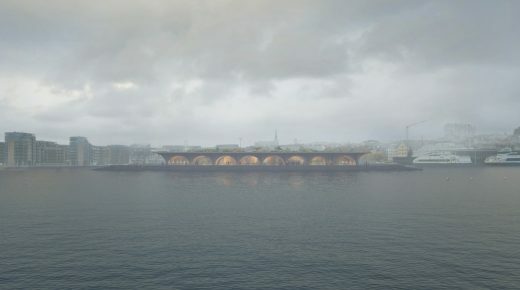 It was important to create a museum with a high level of sensitivity towards these surroundings, yet at the same time for the new Maritime Museum and Exploratorium to stand out as a spectacular contemporary building and become a landmark of Porsgrunn”, Lars Bendrup explains, Owner of TRANSFORM, and continues: “Our general vision was to turn a backside into a frontside. 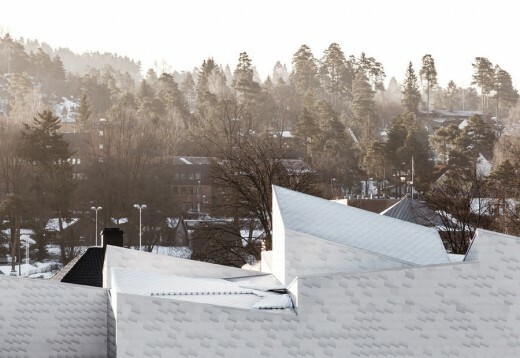 With the new museum the town will now orientate itself towards the beautiful river, which for much too long has been Porsgrunn’s industrial backside”. The new Maritime Museum and Exploratorium is composed of eleven smaller square volumes, together amounting to almost 2,000 m2. Each volume has a different roof slant that assembled make up a varied roof structure. 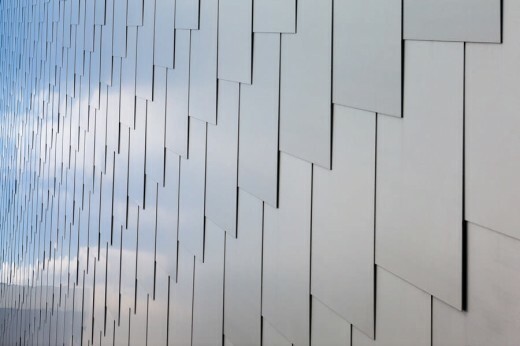 A characteristic aluminum facade, locally produced in Porsgrunn, not only holds the dynamic building structure together, but at the same time it reflects light and colors from the surrounding Norwegian mountain landscape. Dan Stubbergaard, Founder and Creative Director of COBE, elaborates: ”It is a sensitive art adding new to old in a historic area. First of all we wanted to understand the area’s characteristics and then we wanted to strengthen it but at the same time create something new and contrasting. The abrupt building structure of downscaled building volumes and the expressive roof profile are for example clear references to the area’s historic small wooden buildings, which all have their own particular roof profiles. This interpretation of the area’s pitched roofs and small wooden building entities sets the final frame for a unique and characteristic contemporary building”. He continues: “The goal was to create a house that not only understands and shows consideration for its surroundings, but also contributes with something radically new and different”. The new Maritime Museum and Exploratorium has already in November 2013 – before its opening – received Porsgrunn Municipality’s building practice prize 2013 (“Byggeskikkpris”). The committee among other things emphasized the expressive form of the house, the aluminium facade, and an obvious readable logic of the building. ”The building is so fine that it puts Porsgrunn on the architectural map”, the foreman of the jury said at the award ceremony. 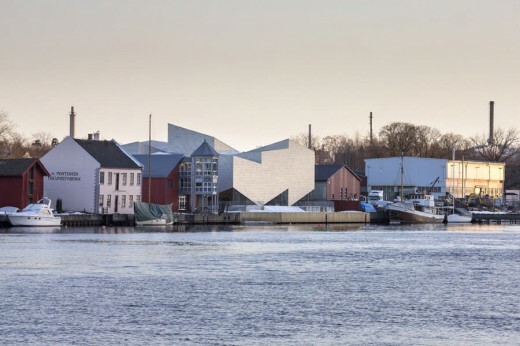 TRANSFORM and COBE have on other occasions collaborated on a range of large scale projects in Denmark and abroad, and the new Maritime Museum and Exploratorium only adds to the list of cultural buildings designed by the two architectural firms. 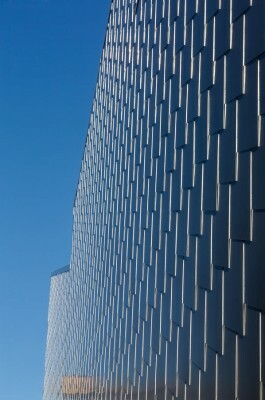 The two firms are also behind the award winning Culture House and Library in Copenhagen’s North-West area, built in 2011. 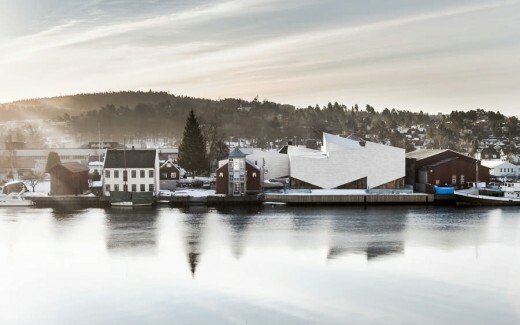 The iconic character of the new Maritime Museum and its attractive location at the river close to the city center makes this new building a natural landmark for the city of Porsgrunn. Furthermore, the new museum building is the first step towards a big new master plan development for Porsgrunn City Center – also designed by COBE and TRANSFORM. The city of Porsgrunn has a long maritime history of shipping and the unique development of the region is clearly visible in the existing remarkable building structure of the area. 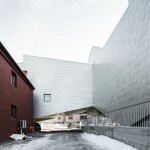 The concept of the museum shows a high level of sensitivity towards the existing small buildings yet simultaneously stands out as a contemporary public building. All public functions of the building are situated on the ground floor and have direct access to the outdoor areas including the new promenade towards the river. The central entrance area is the building’s main room from where all other rooms are distributed. 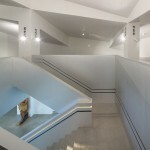 This multifunctional space is defined by a central characteristic staircase that folds down from above and invites visitors upstairs to the large, enclosed exhibition area. Here various room heights and a distinct ceiling line emphasizes an airy and continuous space. 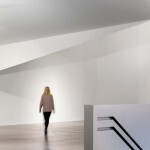 The exhibition space is composed as an open flexible space, gently subdivided by the roof into 9 different spatial experiences. The 9 spatialities can be separated or combined thereby providing a sound functional setting for small and large exhibitions. COBE seeks to develop specific, innovative solutions for each assignment, with competences that include the physical realization of architecture, strategic urban planning, urban and landscape design, and research. In COBE’s work sustainability is a built-in opportunity, and a design tool to develop holistic projects. COBE’s approach to design, architecture and planning is to be visionary in the ambition, and responsible and sympathetic in the result. Since the beginning COBE has gained a reputation as an innovative company, by winning a number of high profile projects and prizes. Currently COBE is realizing major projects such as the Rockmagnet – Denmark’s new Rock Museum, the new Nørreport Station, the Danish pavilion for EXPO 2012 in South Korea and two of Copenhagen’s most significant urban development projects: Copenhagen’s new science city North Campus and the Northern Harbor project; Scandinavia’s most extensive, most ambitious metropolis development project. Beside the newly opened Culture House and Library in Copenhagen North-west, you can also visit Taastrup Theater which was completed in 2009, and in 2014 you can experience COBE’s new Nørreport Station. TRANSFORM is a younger architectural office focusing on urban plans and urban buildings. The office was founded in the late ’90s in the fertile, academic environment around the Aarhus School of Architecture and has since 2005 been owned and managed by Lars Bendrup, Architect MAA. TRANSFORM has a knowledge and research-based approach to the projects and focuses on the strategic aspects of urban development and design. TRANSFORM aims to combine knowledge of and sensitivity for the physical construction with the understanding and experience of the city’s large scale planning opportunities. 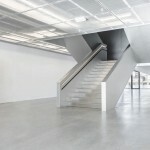 TRANSFORM has gained experience with cultural institutions from several projects, among others the project Cultural Center and Library NV Copenhagen – completed in May 2011. Back in 2004 TRANSFORM won the first prize in the competition for a new Arctic Culture and Theatre building in Hammerfest, Norway, and the following year – 2005 – the third prize in the competition for a Concert and Theatre building in Kristiansand, Norway. The office’s unique understanding of planning has proved to be a powerful tool for the understanding of large, complex buildings. Thus TRANSFORM received the first prize in the competition for the energy-efficient office building in Bjørvika, Norway, and the first prize in the competition for the conversion of Danish Industry’s head quarter at the Town Hall Square in the City Center of Copenhagen. 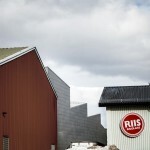 TRANSFORM has started the construction of DI’s 50,000 m2, the project is expected to be finalized in 2013. At present TRANSFORM is designing the project “Klubø Vejle” – a new club house for the maritime clubs in Vejle. TRANSFORM is based in Aarhus and has today 15 employees.